2 button suits can be found in all the latest styles at mensUSA. 2 button suits are the most popular style worn today and mensUSA has every style to meet all of your fashion needs. 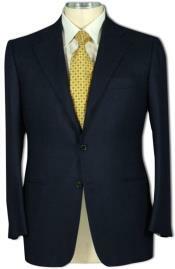 The 2 button business suit is a staple of the well dressed businessman of today. 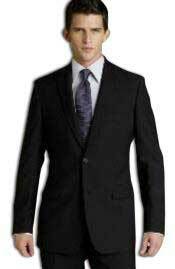 A 2 button business suit should be the foundation of your business wardrobe. 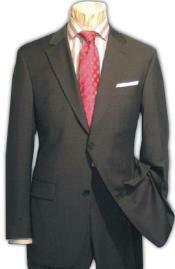 Our 2 button suits come in a variety of styles and fabrics that will dress you for success! Wool is a popular choice for an everyday wear business suits and there is no shortage of choices here at mensUSA. Wool is a great choice for its durability and the natural fibers of a wool suit are in fact a cool choice in warm weather since the fabric breaths better. Polyester is also a great fabric choice because it is durable as well and comes in bright colors and many different styles, as well as being wrinkle resistant. No matter which fabric you ultimately choose you will look your best with any suit you choose at mensUSA!. 2 Button suits are preferred by Business men for official Business meetings. It's also called 2 button Business suit for this very reason. 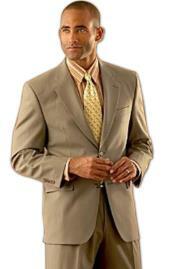 2 button suits comes in various colors like Navy blue, black, brown, light blue and more. Two button suits are worn in weddings. 2 button suits are an amazing addition to your collection and excellent wear in weddings. 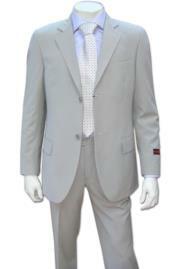 When you are getting married or attending wedding two button suit is the right choice for you. Another consideration when choosing your 2 button suit is whether you want to buy a solid color or one of our many pinstripe styles. 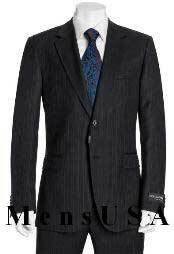 A pinstripe 2 button suit exudes style and confidence. One of the more popular choices for todays businessman is the charcoal pinstripe suit that should be in every mans closet. A charcoal pinstripe suit to fit any occasion can be found amongst the many different styles of 2 button suits offered at mensUSA. Black pinstripe suits are also a very popular choice and can be found in many different types of stripes, they should also be a consideration when putting together your business wardrobe. A navy pinstripe 2 button suit is also a suit that should be in your closet and we have them with and without a vest for your consideration. So no matter your choice you can be assured that we here at mensUSA will help you to look your best in whatever situation you find yourself needing a great suit! 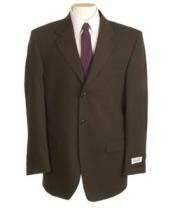 2 button suits are also a bargain at mensUSA and can be found for prices starting at only $79! The prices of our 2 button suits here at mensUSA are just a fraction of what you would pay elsewhere for similar quality suits. Here at mensUSA you do not have to pay inflated prices for your 2 button suit to look your best. 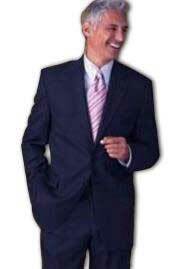 Our 2 button suits are a bargain compared to other suit stores so just check prices yourself and you will see. We here at mensUSA have quality 2 button suits that fit every budget. 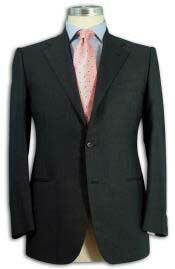 Our 2 button suits are made of the finest materials available and our tailors are the best in the world. 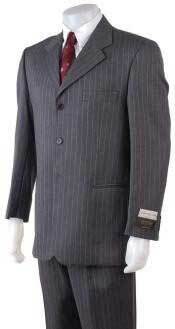 The quality of our 2 button suits will amaze you when you try one on and you will be impressed with the price even more! There is no excuse to not buy your 2 button suit from us here at mensusa!